"Want to try a new take on a classic burger? 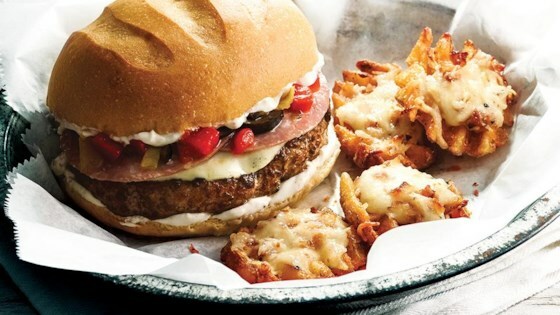 Top your grilled burgers with provolone and salami to create something new. Pair it with crispy potatoes covered in cheese, bacon and peppercorn dressing for a meal that can't be beat." Preheat grill pan (or grill). Form meat into four patties; sprinkle with seasoning (wash hands). Place patties in grill pan (or on grill); grill 3-4 minutes on each side or until meat is 160 degrees F.
Top each patty with 1 slice cheese and 2 slices salami; let stand to melt cheese. Combine chopped roasted peppers and olives. A big, bad burger with major mojo for your Mardi Gras party.